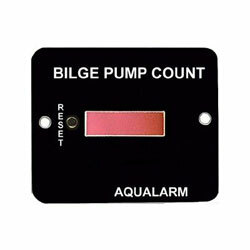 The Bilge Pump Counter is a very good addition to any vessel's Bilge Alarms. A micro processor and printed circuit is used in this Aqualarm's boat electronic product, for reliability and timing accuracy. Bright LED digital readout with "RESET"